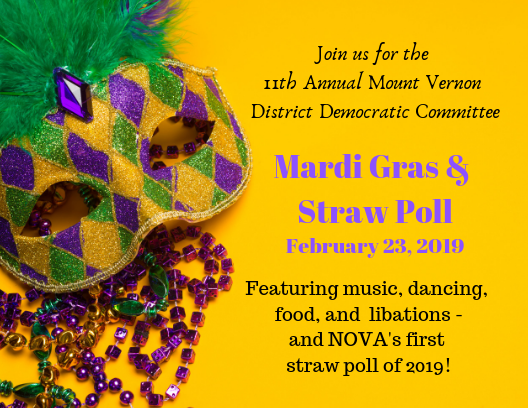 The Mount Vernon District Democratic Committee (MVDDC) is excited to host its 11th annual Mardi Gras & Straw Poll! Join us to cast your vote in NOVA’s first Straw Poll of 2019 and stay for dancing, music, food, and libations! Tickets are $65 each at the door until we sell out – get there early! Sponsorships available – join the Krewe of Democrats! Online sales are now closed – sponsorships can be purchased at the door! Questions? Contact us at events@mvdemocrats.com.